NREGA has suffered some major setbacks in recent times. Choking the programme with fund crunch is the worst attack NREGA has seen. It has resulted in large amounts of pending payments. Also, very few works have been opened in the financial year 2014-15. The rural development minister has gone on record saying MNREGA is stalled due to lack of funds from the Centre. Any other year, we would have put pressure on Govt. for opening works. This we are spending our energy on mobilizing for payment of pending payments instead. It is this struggle of pending payments that led us to petition right up to the district magistrate in Araria. Finally the Deputy Development Commissioner (DDC) of the district announced block level camps (in the third week of September) for all nine blocks in Araria to solve matters related to pending payments. 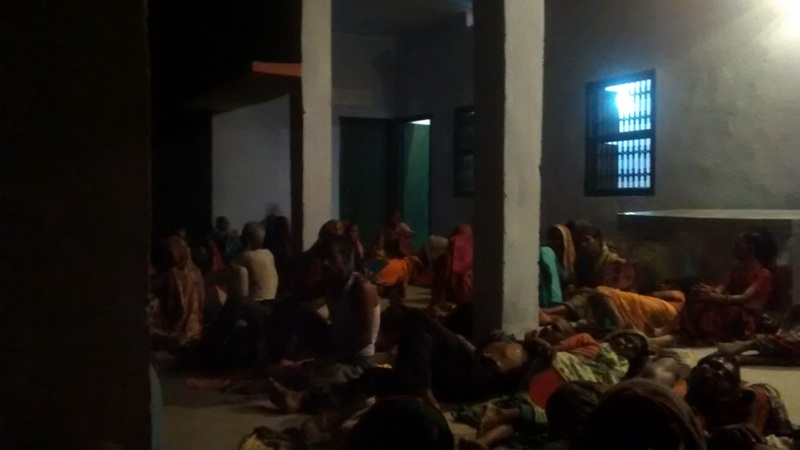 Interestingly the camp in Araria, turned into a satyagrah because of the non-cooperative attitude of the block level Programme Officer. Despite heavy rains on all three days over 100 people stayed the night and over 500 people would sit through the day at the block office. Foodgrains were collected in every village and khichri was cooked at the Block Office. What was amazing about the whole protest was the way it came about. There had been anger for sometime regarding non payments of wages, and when there was no response from the block administration in the camps that was announced, people who had come for the camp decided to stay back. As a result of this sit in payments were given to workers in five Panchayats. However, two important panchayats, namely Bhojpur and Jamua, still await payments. To the best of our knowledge the district administration has asked for 10 lakh rupees on 25th September (Rs. 10,00,000) for these two Panchayat but there is no sign of the money coming. 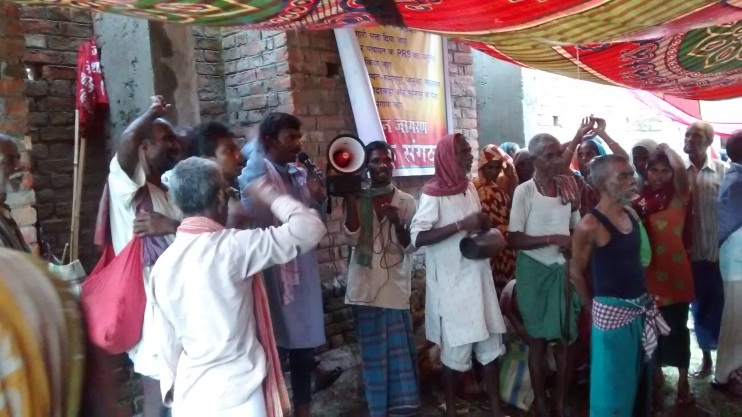 In Raniganj block the satyagrah lasted only on day one of the camp, as the local administration was cooperative and ready to work through problems arising due to pending payments. As we were struggling with the above mentioned problems at the local level the new Government decided to further curtail NREGA by introducing changes like changing the labour material ratio from 60:40 to 49:51 (without increasing the budgetary allocations to NREGA), restricting NREGA to 200 districts of the country and setting a fund cap for each state. We came to know of these planned changes very early through the RTI filed by Nikhil Dey of MKSS. In response to these drastic measures the People’s Action for Employment Guarantee (PAEG) held a press conference in Delhi on 8th October, 2014. Read the press note here. The proposed changes to NREGA were one of the most fundamental reasons why thousands of JJSS members headed to Delhi for the rally on 2nd December, 2014. Because of the massive opposition to the proposed changes the govt. seems to be have postponed the idea. Unemployment allowance case: JJSS has filed a writ petition in Patna High Court on behalf of 7000 workers to seek unemployment allowance for work not provided to them under MNREGA. Case has been listed and we are waiting for our first hearing in the court. As you may already know, unemployment allowance must be given to the workers if work is not provided to them. However, rarely this provision is implemented anywhere in the country. In one of the rare instances, in 2011, JJSS workers received unemployment allowance after waging a long struggle. JJSS is also trying to stay involved with IPP, a participatory planning exercise initiated by Govt. of India to plan for development in Panchayats.